Our Walsall branch caters for both professional decorators and the general public with a large range of wallpapers and paints. We’re a relatively small branch, but we more than make up for it with a personable service and our comprehensive product range. Of course, we can also order any product stocked by Brewers into store within a few days. 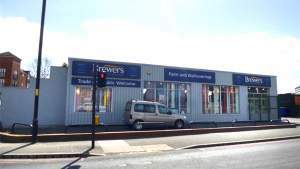 Brewers Walsall also offers protective coatings expertise, so professionals, tradespeople and designers can source specialist paints and tap our team for product and application advice for more unusual painting requirements. We have a prime position on the corner of Littleton Street and Hatherton Street, about 100 yards along from Tesco and Walsall College. There’s ample parking for vans and cars, and convenient disabled access to the store. Head south on Hatherton Street, follow the road and go straight over at the traffic lights, the store is located on the right. Head west on Lyttleton, at the traffic lights turn left onto Hatherton Street. The store is located on the right. Head east on Littleton Street, turn right at the first cross street and the store is located on the right.